POW! WOW!, a gathering of contemporary artists who engage with the broader community through the process and creation of art, has announced plans to expand its presence within Asia. A series of weeklong events in Japan and Taiwan from Oct. 17 through Nov. 21 will feature renowned artists such as Case, Kinsey, Fafi, Ben Horton, Faith47, Kevin Ancell, Naturel, Jeff Soto, Omen, Usugrow, Kami, Sasu, Yoshiyasu Tamura and more. Starting in September, Microsoft will support the painting of a legendary wall in Shibuya with some of Japan’s best artist. Then from Oct. 17, artists from across the globe will assemble in Tokyo to invigorate the city with live art, installations and musical performances. POW! WOW!’s Japan debut reflects the popular art festival’s growth and commitment to expand to the world’s top art destinations. POW! WOW! Japan will be centered in Tokyo with over a dozen live murals being created simultaneously within a one-block radius in the Tennozu area. Exhibitions will happen in Shibuya, Harajuku, as well as at the October 24th Block Party Finale presented by Hawaiian Airlines on Bond Street in Tennozu. The free Hawaiian-themed block party celebrates the new murals and includes the sights, sounds and tastes of Hawaiʻi by offering live music by the POW! WOW! School of Music and the Hawaiian Airlines Serenaders, limited-edition Hawaiian Airlines-branded apparel, island-inspired food trucks, daylong family activities and more. Lee Anne Wong, owner of Koko Head Café and Hawaiian Airlines featured chef, will be serving dishes from her new Hawaiian Airlines in-flight Japan menu. Hawaiian Airlines and POW! WOW! 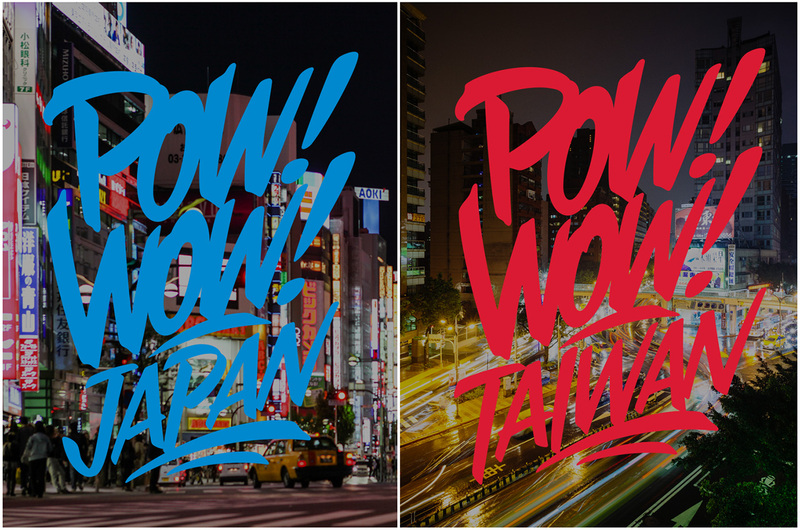 also recently collaborated on exclusive co-branded merchandise designed by POW! WOW! artists Kamea Hadar and Toku. Items include hand dip-dyed indigo T-shirts and hoodies, as well as pocket T-shirts that incorporate the airline’s B717 aircraft fabric. All merchandise will be available for purchase at the Hawaiian Airlines tent. Hawaiian Airlines, a proud supporter of POW! WOW!, operates service to various destinations in Asia, including Tokyo, Osaka and Sapporo in Japan. Starting Oct. 31, on the heels of POW! WOW! Japan, the art festival will continue across three major Taiwan cities, Taipei, Taichung and Tainan, which will house new murals that will completely transform the country. Since its inception in 2010, POW! WOW! has grown into a global network of artists and organizations, gallery shows, lecture series, art and music schools, mural projects, concerts, live art installations and a uniquely-designed, collaborative space named Lana Lane Studios in Honolulu. The title event, which happens in February during Valentine’s Day week on O‘ahu’s Kaka’ako downtown district, draws over 100 international and local artists who create murals and other art forms. The festival continues to grow with upcoming U.S. events slated for Austin, Texas, Long Beach, Calif., Washington, D.C., and Guam. International events are planned for Singapore, Jamaica, Berlin and more. The festival is sponsored by Microsoft, RVCA, Montana Cans, Flexfit, Knockaround, Hawaiian Airlines and 1XRun.